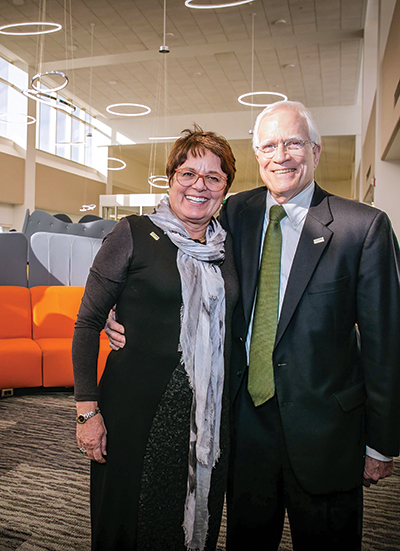 Peek into the new Judy and Robert H. Rawson, Jr. Learning Commons in the Cleveland-Marshall College of Law and you might marvel at what you see. Students aren’t peering into their smart phones. They’re talking, engaging and working together in an open, “smart” space designed to enhance technologically advanced collaborative learning. The brightly colored, 6,500-square-foot Commons is housed on the second floor of the Cleveland-Marshall Law Library. 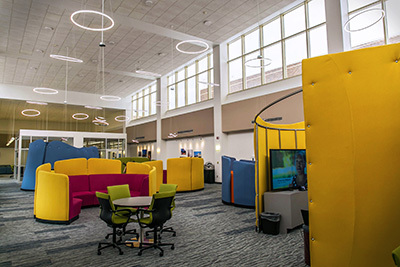 Features of the innovative space include a large gathering area with SMART monitor technology for delivering annotated talks, study rooms with monitors and file sharing capacities and “pods” where students can gather for informal discussions and brainstorming. Several pods are equipped with whiteboard tabletops on which students can quickly record their thoughts and ideas, and then capture a photo for future use. Technology throughout the space is designed so that students can share information with each other from their personal devices. “Having been in the legal profession for more than four decades, we believe the Learning Commons is consistent with the direction the profession is moving regarding team effort and collaborative work,” says Rawson, who served for 15 years as partner-in-charge of the Cleveland office of Jones Day and for nine years on the CSU Board of Trustees, including five years as chairman. The Learning Commons is decorated with city photos taken by Judy Rawson, former two-term mayor of Shaker Heights, who said she chose shots that depict Cleveland’s history, architecture and future. The Commons was made possible through a $500,000 gift from the Rawsons.